How do octopuses adapt to the special circumstances of captivity? Octopuses are well-known due to their intelligence and capability to solve puzzles. Also, their body shape, actually there is no shape at all, is mostly used as a template to create an alien body form by science-fiction and comic book writers. However, there are more intriguing facts about them, the conducted experiments on octopuses indicate that this creature with no internal shell change their behaviour when we observe them in captivity. To understand the fact that octopuses know the place in which they dwell, we have to look at the branches of the evolutionary tree of octopuses. The smaller branches of the evolutionary tree coalesce into bigger branches. Invertebrates are the biggest branch of the evolutionary tree of octopuses, including crabs, bees, worms, clams, snails and so on. Mollusks are the part of the invertebrates, including the cephalopods. The phylum of the mollusks is one of the largest groups in the animal ⚊ than 70.000 species have already described. Many mollusks live in the sea, and others are found in freshwater lakes, ponds, and streams. Most mollusks also have an unusual structure called the foot(1). Cephalopods, including octopuses, squid and so on, are the part of the mollusks and very intelligent predators. They sprout tentacles as a part of the foot to grasp things and to hunt their prey. It is the reason why they spread and live that long. The explanation is as follows. “The opportunity the cephalopods were seizing by rising up into the water was the opportunity to feed on other animals, to become predators themselves. (2)” In that regard, octopuses became the master of using their tentacles(actually in this case, their arms) as a vital tool in feeding and hunting. Grasping and holding things with eight arms perpetuate the improvement of their arms equipping new abilities such as sensing temperature and scent, hence the distinctive self-aware arms of octopuses. The octopus brain is the base of their nervous system controlling their body, but each one of eight arms work as a sub-unit ⚊ moving independently and evaluating the grasping object on its amount or number. Furthermore, octopuses can disassemble, carry and assemble compound objects, the coconut-house behaviour(4), as regards their impeccable object recognition ability. So, we can say that the intelligence of octopuses is due to their unique and impressive body structure. These animals with a soft-body, blue-green blood and three heart have a different insight of world than us, and it would be more accurate to rethink octopuses' perception of captivity by their body structure. This notion is known as embodied cognition(5) in psychology. In that regard, maybe they do not adapt to captivity, we adapt to their intricate perception of their human keepers. (1) Fitzpatrick, F.L. "Mollusks." The New Book Of Popular Science Vol-4. Grolier Incorporated, 1988. 216-217. Print. (2) Godfrey-Smith, Peter. "Evolution of the Cephalopods." Other Minds: The Octopus and The Evolution of Intelligent Life. London: William Collins, 2018. 46. Print. (3) Godfrey-Smith, Peter. 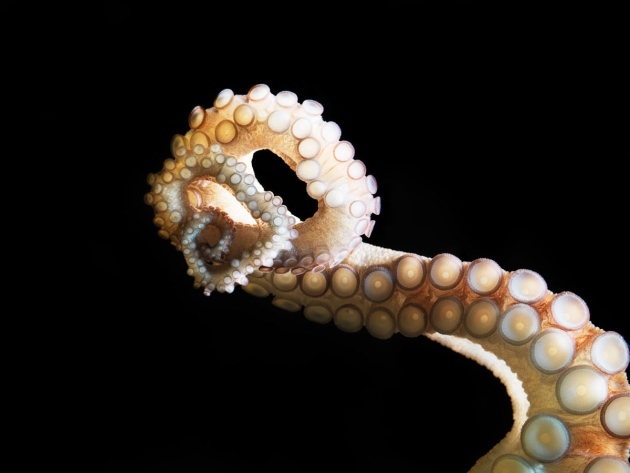 "Puzzles of Octopus Intelligence." Other Minds: The Octopus and The Evolution of Intelligent Life. London: William Collins, 2018. 56. Print. (4) Godfrey-Smith, Peter. "Visiting Octopolis." Other Minds: The Octopus and The Evolution of Intelligent Life. London: William Collins, 2018. 64-65. Print. (5) Cowart, Monica. “Embodied Cognition” Internet Encylopedia of Philosophy, Internet Encylopedia of Philosophy, www.iep.utm.edu/embodcog/.